After a whirlwind first day yesterday, I’ve familiarized myself with the processes of finding and accessing the treasures housed in this collection. And while the rules and restrictions unique to most rare-book and manuscript libraries — no pens, no food, no liquids, no flash photography, etc.(!) — are strictly enforced, it’s always clear that everyone involved with this world-class institution is highly committed to preserving these precious items for centuries to come. I am only happy to follow their lead. So as I look around in this august, book-lined space, portraits of notable personages peering down at us as if to enforce the gloriously deep silence, I catch glimpses of the rapt faces of many of the other visiting fellows currently in residence. And while I only have the faintest notion of what any of them is specifically working on at any given time, we’re all in our own worlds of discovery and awe. When one scholar this morning received the item that she had earlier placed on hold, she whispered, “That is so cool!” Each time that I receive my own requested items from the stacks, hand-delivered by a Houghton librarian, I have to admit that I feel exactly the same way. 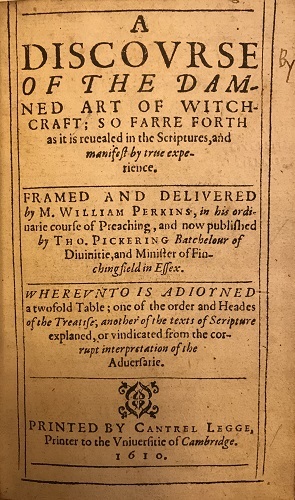 First-edition cover page of A Discourse of the Damned Art of Witchcraft (1610) by William Perkins (1558-1602), all of whose books were posthumously banned by the Catholic Index of Forbidden Books. I am honored to be here researching one of my most enduring pet academic interests, the Catholic Index of Forbidden books, or Index Librorum Prohibitorum. 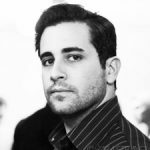 And this is exactly why I am so eager to share with you the details of my fellowship on this particular blog. It hath alwaies beene the unhappiness of new truths in Philosophy, to be derided by those that are ignorant of the causes of things, and rejected by others whose perversenesse ties them to the contrary opinion, men whose envious pride will not allow any new thing for truth which they themselves were not the first investors of. In other words: Innovative ideas and ways of thinking are perhaps the most durable of currencies in human society, especially over long periods of time. And, what’s more, new ideas have always had to fight against many older ones to be heard, much less acknowledged, respected, or accepted. Though he may not have particularly minded as an Anglican Protestant (and also, he happened to already be dead at the time), Wilkins’ delightful book of philosophical musings on the nature of the moon as a potential habitable world was banned by the Catholic Index of Forbidden Books on April 25, 1701. Old in wisdom but young at heart, she meets the three hundredth class as she met the first, eager to kindle in them that desire for truth that makes men free. So yeah, I’m fan-boying a little bit here. 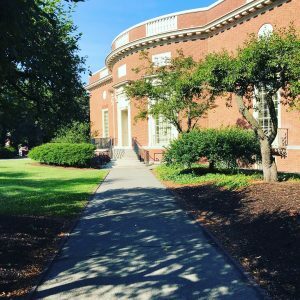 But, I implore you, cut me a little slack; it’s Harvard, I’m a librarian, and I’ve been set free in one of the most amazing libraries in the world.